This website is dedicated to Raymond F. Jones (1915-1994), the author of many highly regarded science fiction novels and short stories. His work appeared in magazines such as Thrilling Wonder Stories, Amazing Stories and Galaxy. Jones' first published story, "Test of the Gods", was published in Astounding Science Fiction magazine in 1941. Over the next three decades Jones went on to write an impressive array of entertaining science fiction tales until his final story, "Death Eternal", was published in Fantastic Stories in 1978. His easy, flowing style of writing won him many admirers. His best known novel, This Island Earth, was adapted into a feature film by Universal Studios. Jones' early short stories, including "Noise Level", "Black Market" (a story which served as an inspiration for H. Beam Piper's Paratime series) and "The Person From Porlock", are widely considered to be classics of the genre. With tales such as "Production Test" and "The Model Shop", Jones created rare literary gems that are crying out to be read today by a modern audience. 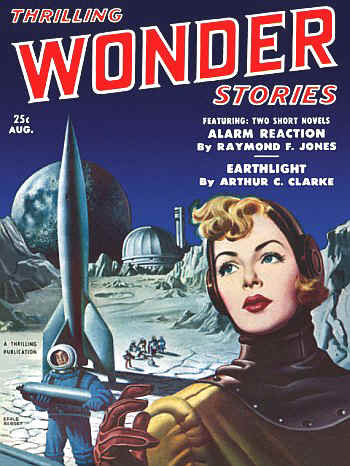 Many of his science fiction stories placed a good deal of emphasis on scientific and technical matters, while in others, including powerful pieces such as "The Farthest Horizon", Jones wrote thoughtful stories with believable characters. These talents made Jones a highly respected writer of science fiction in the 1940s and 1950s. He was a regular contributor to Astounding Science Fiction magazine; one of a large group of writers influenced by the magazine's editor, John W. Campbell. In this website you will find a checklist of his novels and short fiction, images of book and magazine covers (including some superb pulp cover artwork from the 1940s), links to other webpages with information on Jones, a guide to his short stories, and a page with transcriptions of two autobiographical sketches written by Raymond F. Jones. Whether you are a fan of Raymond F. Jones or merely curious about his work, I hope that you find this site informative and entertaining.